Corrosion-resistant, 16" steel wheel features an 8 on 6-1/2 bolt pattern and meets Department of Transportation standards. Lowest Prices for the best tires and wheels from Americana. 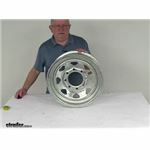 Steel Spoke Trailer Wheel - 16" x 6" Rim - 8 on 6-1/2 - Galvanized Finish part number AM20781 can be ordered online at etrailer.com or call 800-298-8924 for expert service. Corrosion-resistant, 16" steel wheel features an 8 on 6-1/2 bolt pattern and meets Department of Transportation standards. 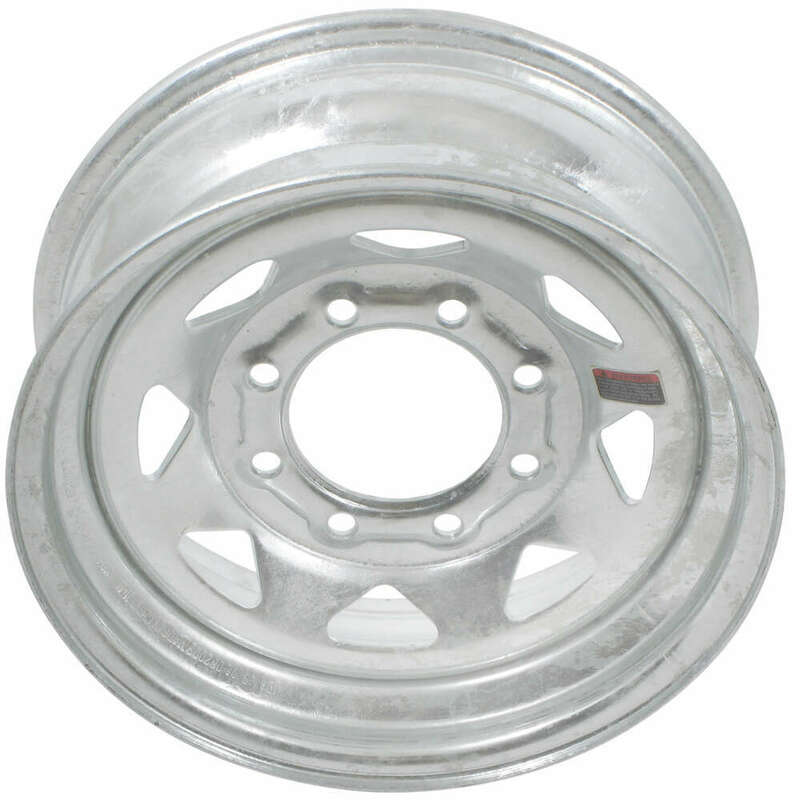 20781 8-Spoke Galvanized Wheel - 16"
16" x 6" Trailer wheel has an 8 on 6-1/2 bolt pattern and a 4.88" pilot diameter. Rustproof aluminum wheel has a sleek design in black. Steel inserts in lug nut wells secure wheel. Complimentary roadside assistance included. Order: RelevanceNewestRating - High to LowRating - Low to High Corrosion-resistant, 16" steel wheel features an 8 on 6-1/2 bolt pattern and meets Department of Transportation standards. According to Americana, the Dexstar Steel Spoke Trailer Wheel, # AM20781, is rated for 3,750 pounds when mounted with a properly sized tire inflated to 110 psi. 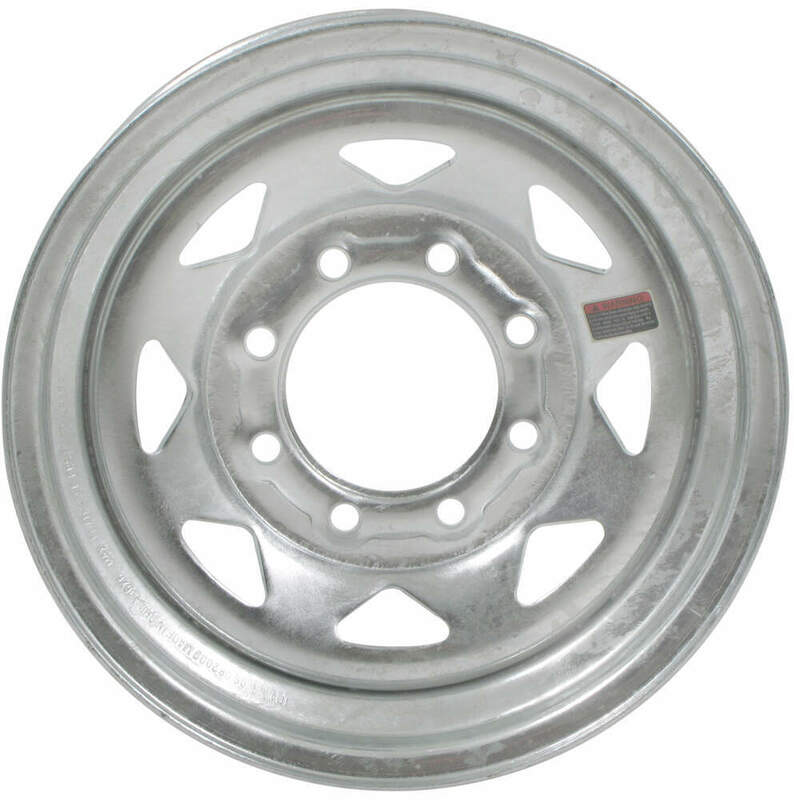 This 16 inch steel wheel has a galvanized finish, 8 on 6-1/2 bolt pattern, and has a pilot diameter of 4.9 inches. On your wheel, the 2040 lb indicates that this wheel by itself is rated for 2,040 pounds. So for 2 of them on 1 axle, they have a capacity of 4,080 pounds or whatever the axle capacity is, whichever is lower. If you have a set of the same wheel then you have nothing to worry about since the camper weighs 3,500 pounds. 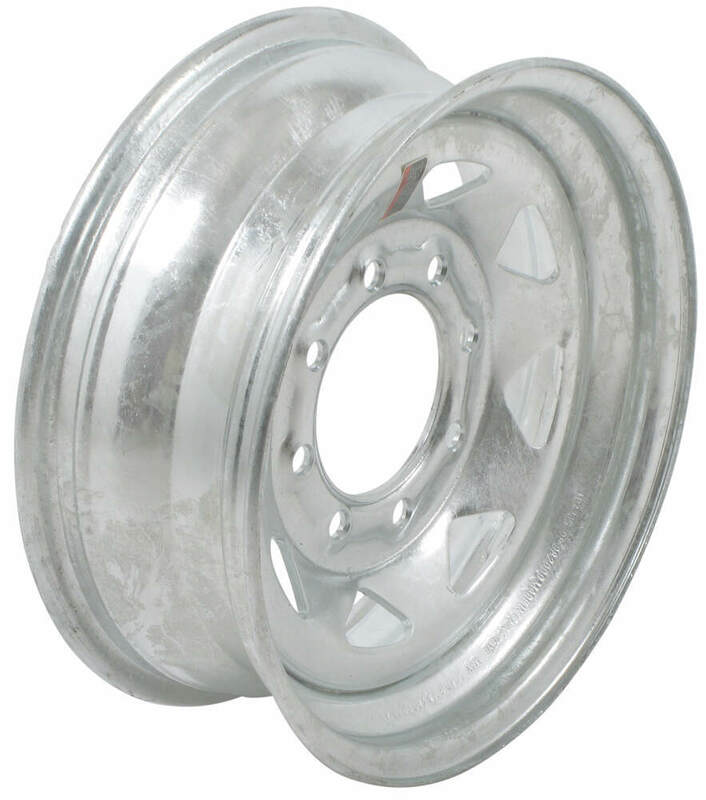 Americana galvanized trailer wheel # AM20781 has a zero offset. The mounting surface is centered on the wheel. All the wheels we carry will have a zero offset unless otherwise stated in the title and description of the wheel. Conventional 16 inch steel wheel # AM20766 with the same bolt pattern has a positive 1/2 inch offset. Aluminum wheel # AM22691 has a positive 5mm offset. We do not currently have any wheels that have a negative offset. I verified with my in-house wheel and tire expert that the Dexstar Steel Spoke Trailer Wheel, # AM20781, will fit on 5/8 inch wheel studs as well as 1/2 inch and 9/16 inch wheel studs.